It's fairly obvious how Steven Spielberg would like you to know how important due process is. Bridge of Spies, the master filmmaker's latest real-life, politicized Cold War period drama is a cinematic testament to his American ideals set against the height of U.S.-Soviet tensions along the 1957 East Berlin border. The director's string of later, smaller but still meaningful work continues with this film in the mould of recent historical stories like Munich and Lincoln. Beloved actor Tom Hanks again inhabits the folksy but whip smart and competent everyman (akin to Jimmy Stewart) as a mild-mannered Brooklyn insurance lawyer, James B. Donovan, tasked by the American government to defend a Soviet spy to assure he's given more than just a show trial while later negotiating his exchange for a shot down U-2 pilot captured on a secret mission for the U.S.
Acclaimed British stage actor Mark Rylance shines as the stoic and unemotional Soviet spy, Rudolf Abel. He's framed as a honourable enemy combatant dedicated to the ideals of his nation much like the Americans who oppose him. The way the film uses Hanks' Donovan to battle injustice at home and abroad while negotiating complex political drama between the East Germans and Soviets is universal in its humanity. Co-written by Joel and Ethan Coen from Matt Charman's original script, the film has a strong but serious streak of humour as moments of the bizarre true life tale are highlighted for their absurdities and touchstones between enemies on different ideological sides. Spielberg makes it easy to see the inherent conflicts and emotional toll a war of intelligence and commodities places on its players while using his many filmmaking tools to heighten the film's procedural thrills. 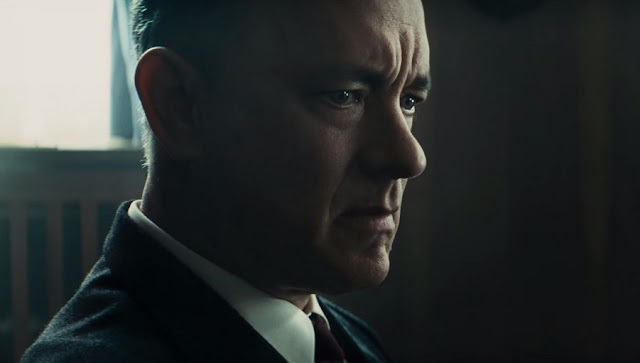 Spielberg graces the very earnest Bridge of Spies with a subdued yet casual mastery of quiet filmmaking. It's never showy in its flashes of sober thoughtfulness as it uses historical drama as a way to explore and show personal heroism in the context of American actions rather elegantly. While it may be tempting to classify this as some of his lighter and possibly lesser fare, it remains a highly effective film of significant historical and cinematic value.